I've said it before, I'll say it again: I have a cool job. My company is really a group of universities and we operate a lot of scientific sites. Probably the jewel in the crown is the Stratospheric Observatory for Infrared Astronomy (SOFIA). SOFIA is a 10-ton telescope mounted on a former United Airlines 747. In the above video, you get a pretty good idea of what this vehicle can do. The engineering behind it and the science it produces are truly staggering. SOFIA is the largest airborne observatory in the world, studying the universe at infrared wavelengths, capable of making observations that are impossible for even the largest and highest ground-based telescopes. During its planned 20 year lifetime, SOFIA also will inspire the development of new scientific instrumentation and foster the education of young scientists and engineers. 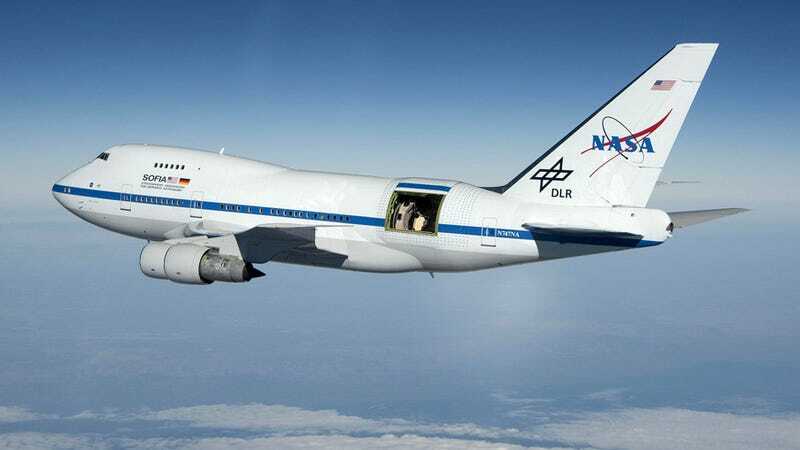 SOFIA is an 80%/20% partnership of NASA and the German Aerospace Center (DLR), consisting of an extensively modified Boeing 747SP aircraft carrying a reflecting telescope with an effective diameter of 2.5 meters (100 inches). SOFIA is based at NASA's Dryden Aircraft Operations Facility in Palmdale, California. The program is composed of two "projects": the Platform Project (aircraft and subsystems) managed by NASA Dryden, and the Science Project, managed by NASA Ames. SOFIA is one of many astrophysics missions under NASA's Science Mission Directorate.